Sterling Systems & Controls, Inc. offers a full line of Bulk Bag Unloading and Weighing Systems that incorporate many of the same structural aspects as the micro, minor, and bulk weighing systems, but are specifically designed to unload a bulk bag or tote, typically into a fixed hopper within the system. Solutions are provided for unloading bulk bags of dry bulk solid materials and filling the supply bins such as drums or tote tippers. In addition, batch weighing can be added along with batching controls. These can include the addition of mechanical or pneumatic conveying, a choice of weighing solutions including gain-in-weight & loss-in-weight. 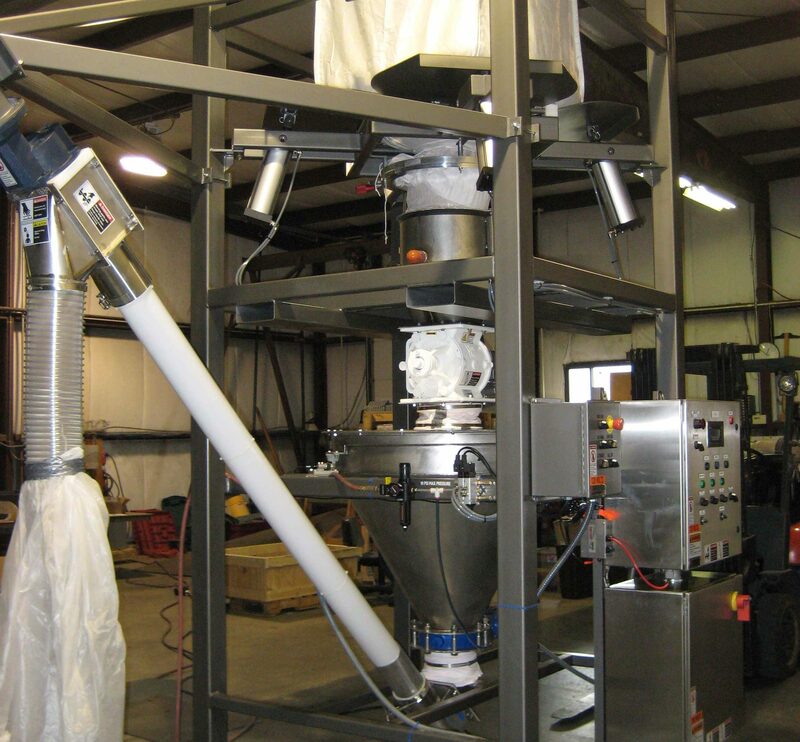 Bulk bag unloading systems that include weighing can be combined with a variety of turnkey solutions for conveying/transporting or dispensing the batch. These carefully selected solutions are used to convey/transport the product to the use points such as a day bin or mixer. Typical conveying systems include pneumatic & mechanical conveyors. Totes are commonly used where cross contamination or product degradation is a concern; both solid surface totes and flexible totes are used. A variety of bulk bag unloading and weighing systems installation configurations are possible, including allowing for the system to be mounted through a floor, or on a floor with legs. Bag Filling Stations are also available from Sterling Systems & Controls, Inc.. We will design the bag filling station (example shown in picture here) within the physical constraints of your facility and can provide the controls as a standalone process, or as a part of the complete manufacturing process automation.